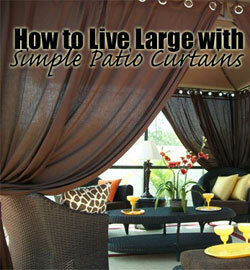 Drapes can turn ordinary patio furniture into an elegant and enticing outdoor living room. They are great as party decor, but some people use them to create a custom, designer look in their backyards year-round. These rich brown panels can provide privacy, screen out the sun and wind and add elegance to any outdoor space (for very little cost). Basic panels that are designed for outside use are typically weather-resistant, so they will not break apart, fade or get a bunch of mildew or mold growing on them. Some are even machine washable. They stay looking good for a long time without any effort. Curtain panels are usually sold independently without hardware or rods because each outdoor space is different. This way, you can buy as many panels as you need to fit your space, and then get hanging rods only if you need them. 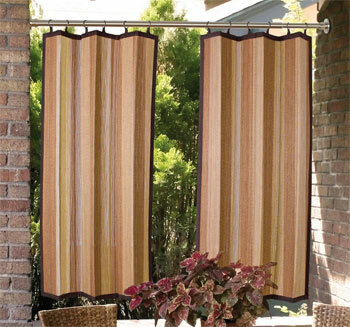 These patio curtains can be used in many places. They can provide privacy, shade and style to any outdoor room, whether you attach them to an roof overhang, a trellis, a walkway, etc.. I like them because they are so functional and easy-care. They are neutral in color, water repellant, fade and mildew resistant and you can even throw them in the washing machine! 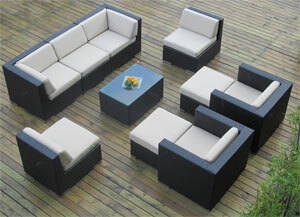 Get several to enclose an outdoor living room – or get a pair for an entry or walkway. 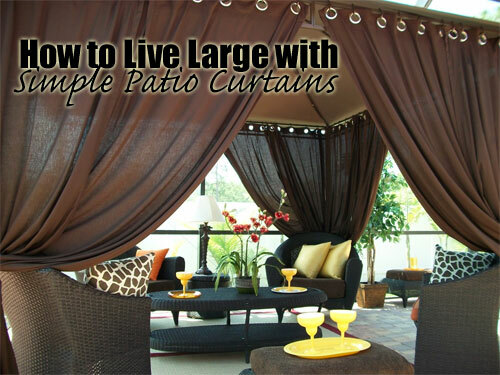 If you have a large backyard or multiple outdoor spaces, using matching curtains is an easy way to tie everything together without having to use matching furniture, etc.. Note: These curtains do not come with any accessories or hardware, so you’ll need to purchase hanging rods separately. This actually works out well, because then you can get the proper length curtain rod for your space. 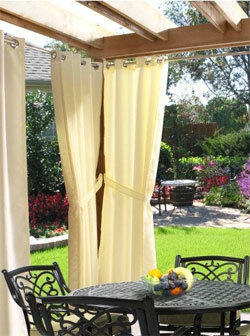 Curtains work well at creating a certain ambiance in an outdoor room and even help make it feel more “indoors”. However, if you simply want something that will block out the sun or provide privacy at certain hours of the day (and then disappear the rest of the time), you might prefer blinds or roller shades. A nice feature of this shade from Coolaroo is that it has no cords that can get tangled or create other problems. It comes with an easy-to-use crank instead. The fabric is weather resistant and blocks 80% of UV rays, yet it is breathable so you can still enjoy a cool air flow on a hot day. Their neutral, light color helps them blend into your home and the surrounding environment. Even when pulled down, they won’t create a dark space. Note: some people even use these shade indoors to block out sun, and therefore lower cooling costs. 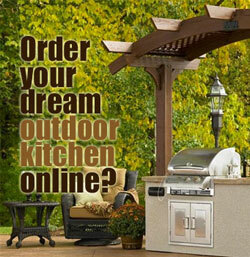 Maybe you want privacy or shade – but you don’t want flowing curtains or pull-down shades. These hanging bamboo panels offer another alternative. They are thicker and heavier that your typical curtain and therefore won’t blow around so much. 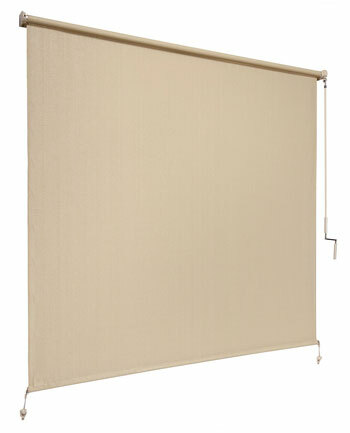 However, unlike pull-down shades, they can easily slide to the side (no cords required). They are made with natural eco-friendly bamboo wood that are strong and weather-resistant (plus treated with water repellant). Their natural brown color and texture make them blend in with natural surroundings, and they look great with wicker furniture or if you are trying to create a “tropical feel” in your outdoor room. These panels are also easy to clean – just use a vacuum hose or soft brush (Bonus! ).